Story: Susie is Calvin's only friend apart from Hobbes. 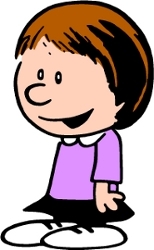 Contrary to Calvin, Susie is earnest, serious and smart. She is often put off by Calvin's jokes, like claiming to have snails in his lunch, and thinks that Calvin is weird, but they get along quite well.